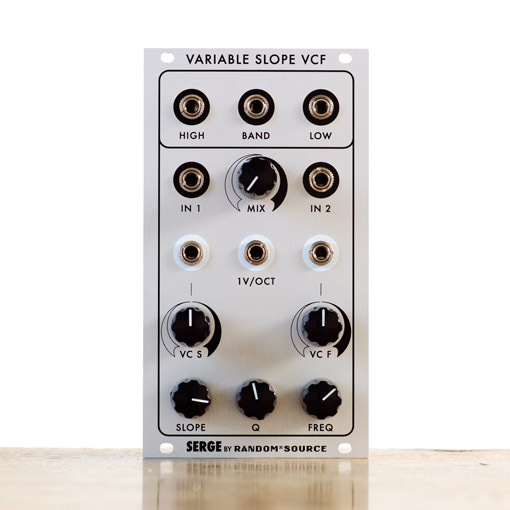 Happy to announce the release of the second Serge filter for Euro, the Variable Slope VCFS - under license and with the kind support from Serge. The R*S version features 2 THAT2180 VCAs for best audio performance - Serge not only approved this, but recently stated that he would have used those VCAs if they had been available in the 70s. 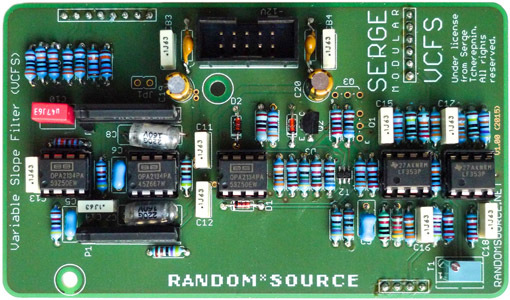 Moreover, the Random*Source edition adds a Q knob, which allows to (substantially) increase the resonance, and has been optimized for an even wider range between minimum slope and maximum slope. See the R*S VCFS page for more info - that's also the order page. Nice! But stop emptying my bank account! What's next? When will it be available? BOM lists 2x OPA2134 and 3x TL072 or OPA2134 and I've noticed that you used 3x 2134 and 2x LF353, any special reason for that or just a matter of preference? Also tayda it's out of stock of 250k B 9mm pots and Thonk doesn't seem to stock them. As usual awesome work Ralf, thank you! me too! Like I don't need more of this stuff, but I will keep building anyway! I'm curious how the VC-Slope function actually works. The filter core is very similar to the VCFQ (minus the Trig In, AGC In, VC-Q and Notch Out). 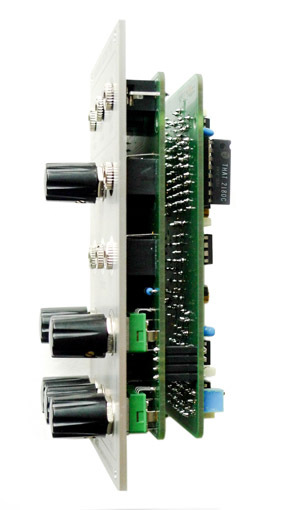 The VC-Slope applies an offset to the second integrator in addition to the 1V/Oct and VC-F circuitry applied to both integrators. The Q decreases as the integrators are driven further apart, like how an sharp image in a camera viewfinder becomes out of focus as you rotate the lense. I'm curious too. I was thinking it was just a cross-fade between a 1st order and a 3rd order filter but I haven't looked at the schematic and thus I suspect I'm very wrong. I don't believe there is a schematic available, that's why I'm guessing! Also, heads up. You listed this as 18hp in this thread. I'm pretty sure it's 14hp. Here's the Mouser BOM I put together. I think it's complete. I will update this as I get the information. Hopefully, this can help others and others can help me. Send me a PM if you find any issues. 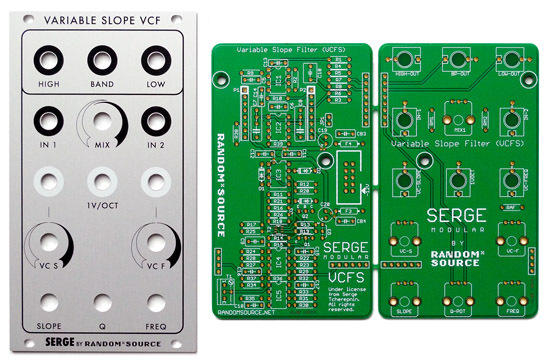 These dudes ensure that non-DIYers can buy the modules at a reasonable price, which I think is only adding to the accessibility of The People's Synthesizer. No need to piss on anyone's parade. I am sure Ralf is here to stay. Here's the Mouser BOM I have so far. THIS IS NOT FINISHED. BOM Red = Not finished. Green = Finished. I will update this as I get the information. Hopefully this can help others and others can help me. Send me a PM if you find other things. This is like 90% complete. If any one could chime in on the troubled areas I'd be extremely grateful! Yes, TI and Burr-Brown merged in 2000! Why 6x 2N3904? You just need three. Can look into the Mica caps later, ordered elsewhere but will give it a quick shot. Oh wait.... I remember why 6.... Just in case anyone wanted to match their transistors.